Bourgeois Chevrolet pays its staff a salary instead of commission because electric cars such as the Chevrolet Volt take more time to explain and sell. Dealer Samuel Jeanson says it can take four times longer to sell a Chevrolet Volt plug-in hybrid than to sell a gasoline-powered car. Still, Jeanson's Bourgeois Chevrolet in Rawdon, Que., stocks and sells every Volt it can get, new and used. Why bother? Bourgeois Chevrolet caters to buyers of electrified vehicles, and Bourgeois figures his store's profit per vehicle is the same for electrifieds as it is for conventional cars and trucks. Bourgeois sold a record 287 electrified vehicles in 2015, including 192 new and 95 used. The total doesn't include 43 presold 2017 Chevrolet Volts and 33 Bolt battery-electric vehicles, cars that are not yet on sale. Bourgeois hit those numbers with gasoline prices dropping in Canada, though they're still about double that of U.S. prices. In October alone, Bourgeois Chevrolet sold 57 electrified vehicles, according to Jeanson, the store's coowner with his brother, Hugo, and uncle, Mario Bourgeois. Buyers for the dealership scour auctions in Canada and the U.S. for used Volts and Bourgeois Chevrolet takes unwanted new Volts from other stores. Bourgeois Chevrolet sold 704 vehicles in 2015, so that means more than 40 per cent of sales were plug-in hybrids and EVs, all this in a town of 10,000 people about 50 miles from the nearest big city, Montréal. "It is an amazing market," says Jeanson, who has sold Volts to customers from as far away as B.C. "Even customers who come in for conventional product and ask for gas, we sell them an EV." Jeanson knows why many stores avoid stocking and selling electrified vehicles. "The business case for EVs is not good for dealerships," he says. "They're more costly to maintain on the lot. It's a $40,000 vehicle compared to $20,000 for a Cruze. The owner of the dealership is not interested in paying interest on a higher-priced vehicle so there's no inventory. "People are asking tons of questions. So if the sales manager doesn't want to sell it, the dealership doesn't order it." But Bourgeois Chevrolet does things differently. The dealership doesn't advertise. The way Jeanson figures it, the Volt will sell itself if customers get a chance to experience it firsthand. 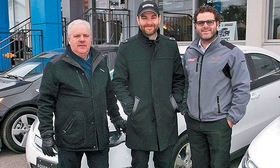 Owners of Bourgeois Chevrolet in Rawdon, Que., (left to right) Mario Bourgeois, Hugo Jeanson and Samuel Jeanson focus on selling electrified vehicles. "Even customers who come in for conventional product and ask for gas, we sell them an EV," says Jeanson. It starts with the sales process. Because customers have more questions about electrified vehicles than conventional vehicles, any sales presentation for an electric will take longer. So Bourgeois Chevrolet pays its sales staff salary instead of commission. "The dealership has been in the family 50 years, and we didn't have any commission for 50 years," says Jeanson. "People want to know how it works. It takes three to four times longer to sell an EV than a regular car. "If a salesman is selling an EV on commission, he's not interested in selling an EV." So Bourgeois Chevrolet sales staff go through the math with customers, explaining how much a kilowatt-hour of electricity costs versus gasoline and how much money they'll save and how a $40,000 Volt can be cheaper to own than a $20,000 Cruze. They start with monthly payments and move on to energy costs, insurance and maintenance. The Quebec government pays an $8,000 rebate to Volt buyers. 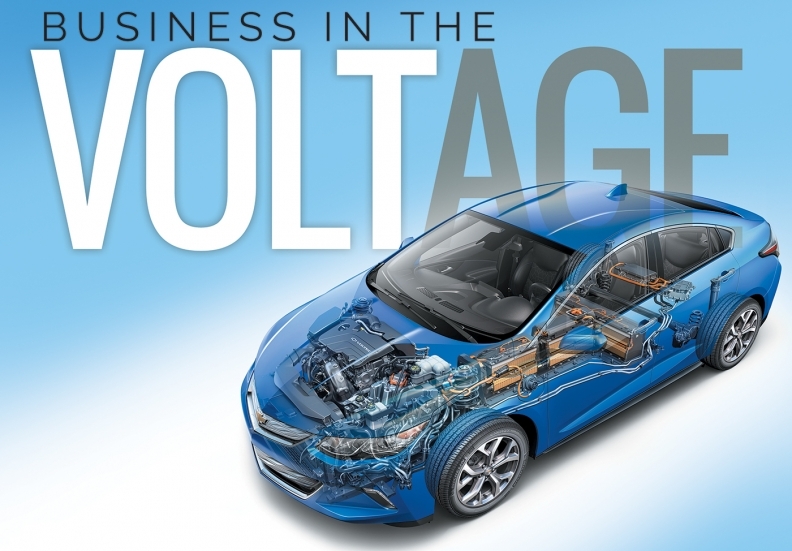 "Very often, the conventional car is more expensive than the Volt," Jeanson says. "The person who saves most with an electric car is the person who empties the battery every day. "Because we're an hour from Montréal, people commute to Montréal. Everyone buying an EV is calculating how much they're going to save." The math works out for the dealership, too, in terms of profit per vehicle. Jeanson estimates that Bourgeois Chevrolet averaged $1,878 per electrified vehicle sold in 2015 including new and used. He says the profit per vehicle is roughly the same for vehicles with conventional powertrains, including pickup trucks. Of 30 Bourgeois Chevrolet staffers, 17 own Volts. All employees, even those who don't own an electrified vehicle, are trained to be electrified vehicle experts. The dealership has 25 Level 2 — 240-volt — charging stations. And eight more are being installed. Many staffers, including Jeanson, also have charging stations at home. But persuading someone to buy a Volt usually takes more than an explanation from an expert. And that's where the extended test drive comes in. Bourgeois Chevrolet lets customers have Volts for three or four days to test drive for free. Customers want to take a Volt to work, to the grocery and on other daily errands to see if they can live with it, says Jeanson. "It's the best marketing we could do," he says. "There are a lot of misconceptions but they realize they can do everything they want. At the end of the week, they just want one." Bourgeois Chevrolet makes sure its customers have a good selection of Volts and other electrified vehicles, so Jeanson and his partners sometimes must travel to buy them. "We bought a bunch of Spark EVs from California," he says. "We buy them from everywhere in North America. I always have 30-40 used Volts on my lot." Even with gasoline prices continuing to fall, Jeanson is optimistic about the future of electrified vehicles, particularly the Bolt EV, due in late 2016. "We have a waiting list already." Another plus is that electrified offerings are bringing in new GM customers. "At least 50 per cent of the customers say, ‘I never thought I would enter a GM showroom,'" Jeanson says. "These are people coming from Toyota, Mazda, Volvo."